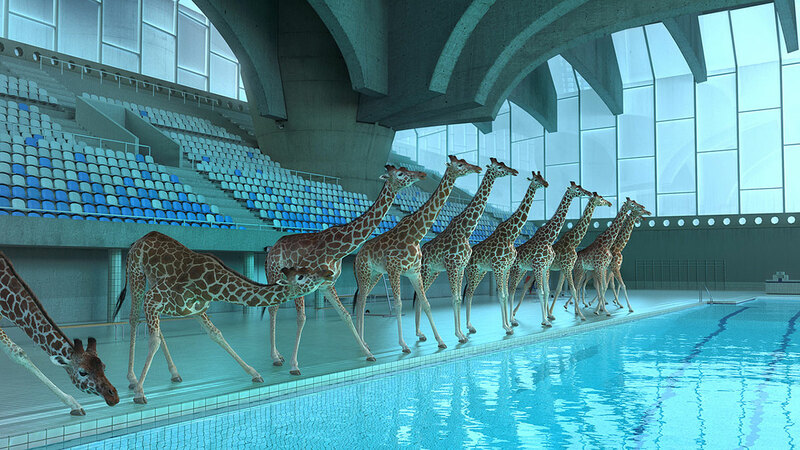 Ever wonder what giraffes do for fun? Wonder no more. Animated by Nicolas Deveaux. The filmmaker’s first film, 7 Tons 2, shows us what elephants do to amuse themselves. – Watch 7 Tons 2 at youtube.com. A young track star’s mother is in a coma. Every time he breaks his own personal records, his mother responds by moving her finger. He is convinced that if he can push himself to the limit, he can continuing breaking records in the long jump and this will wake his mom up. He sets out to make the most dangerous jump of his life. Written and directed by Anders Walter. Principal cast: Benjamin Gabrielsen, Oliver Methling Sondergaard, Thomas Baldus, and Christine Albeck Borge. The film was short listed for an Oscar in 2012. His next film, Helium, won the 2014 Best Short film Oscar and is also part of the ImageMakers episode The Dog in the Window. A creepy man follows a young girl and her mother home from school one day and waits until dark to sneak into their house. The mysterious man won’t leave until he gets what he wants — and doesn’t leave until he gets it. Written and directed by Ben Ockrent and Jake Russell. Principal cast: Alan Rickman, Jodie Whittaker, and Lola Albert.